Create the project-specific glossary and get client confirmation. Use CAT tools to translate UI files. Submit the UI translation to get client approval. Check the layout of user interface in target languages and fix accordingly, including look and feel adjustment, linguistic checking and box resizing etc. The application will be compiled by the client to generate .exe file. Implement the functional testing against the test plan and submit the test report for client further fix. In localized application, capture the needed screens to be used in manuals. The following procedures are depending on the help compilation methods. Use Trados etc. 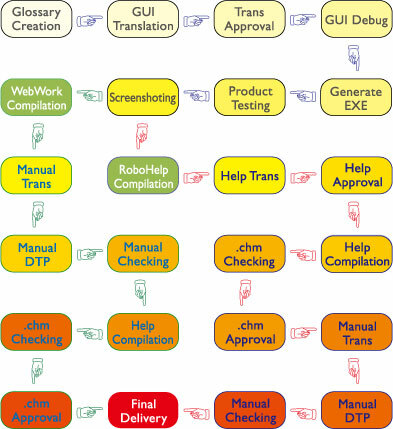 tools to translate the documents, and keep good consistent with online help and GUI in terms. Arrange manual typesetting using special DTP applications. Print PDF. Implement linguistic and layout checking. Deliver the DTPed files for client checking, then make revisions until final approval. 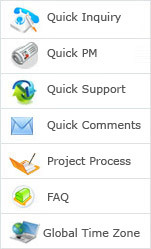 Use special tools to compile the online help files based on the client requirements. Make careful checking on compiled .chm files, including layout and linguistic checking. Deliver the .chm files for client checking and make revisions until final approval. Deliver the final DTPed files as required. Use TagEditor etc. tools to process and translate help files. Send help translation for client approval.